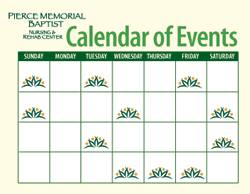 Pierce Memorial Baptist Nursing & Rehabilitation Center offers a truly home-like atmosphere throughout, from our expansive grounds to our common living, dining and recreation areas. Each of our spacious private and semi-private rooms is fully furnished in a traditional décor. Residents are encouraged to add a familiar dimension of comfort such as a favorite chair and collection of family photos. Health care services are coordinated by licensed professional staff and delivered by an interdisciplinary care team composed of: medical director, nursing staff, physicians, social worker, a Chaplin, a registered dietician, physical, occupational and speech therapists and administration.